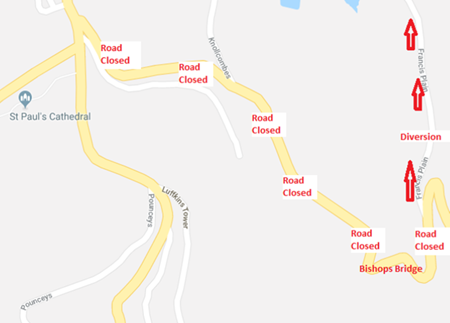 The Roads Section of ENRD would like to inform the public that the Highways Authority has given approval for the road from White Gate to Water Course Road to be closed from 9am to 3pm on Tuesday, 16 April, and Tuesday, 23 April 2019. This closure is to allow the Roads Section to continue with their work on using trial mixes of alternative patching/surfacing methods for the Island’s road network. Senior Prison Officer, Marianne Phillips, and Prison Officer, Ricardo Morana, have recently returned to St Helena following their two-week participation in the Overseas Territories (OTs) Mental Health Awareness Programme in the UK. 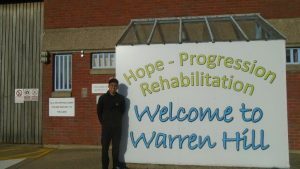 This visit enabled both Marianne and Ricardo to spend a week in a UK prison to observe what provisions are being used within the prison setting and to gain an understanding of the best practices used within mental health provision. The aim is for both officers to adopt some of those practices now that they have returned to the Island. Marianne was based at HMP Swinfen Hall and Ricardo at HMP Warren Hill. “The training was very well received and both Marianne and Ricardo will now be tasked with two things following their return. The first is to impart the training to the other staff in HMP Jamestown, and to use their learning to make improvements within the prison setting for those in our care with mental health issues. This training was funded by the Foreign and Commonwealth Office (FCO) as part of the Conflict, Stability & Security Fund’s (CSSF) Prisons Project under the Overseas Territories Justice, Security & Governance Programme. Eight other UK OTs also participated in the training. Coastal Walking or Hiking is one of the most popular outdoor activities on St Helena. Post Box and Blue Dot walks are among some of the popular trails available around the Island’s coastline. These walks appeal to both locals and visitors alike. Whilst these coastal walks give people the chance to experience St Helena’s rugged exterior and capture some of the most magnificent coastal and cliff edge views, without proper safety awareness or preparation they could easily result in an emergency situation. Walk within your limits. Ensure that you know enough about the demands of the walk beforehand. If you don’t feel comfortable embarking on a particular walk then it might be best to stay behind. The Foreign and Commonwealth Office invites nominations for the 2020 Queen’s New Year Honours List. Nomination forms are available from Corporate Services at the Castle and can also be requested by email from Miss Linda Benjamin, via: linda.benjamin@sainthelena.gov.sh. Completed forms should be returned to the Executive Secretary, Honours Committee, in a sealed envelope, marked ‘Confidential’, by Wednesday, 1 May 2019. In a Statistical Bulletin released by the St Helena Statistics Office today, figures show that St Helenians living abroad have taken advantage of the regular scheduled air service between St Helena and Johannesburg. In December 2018, 336 St Helenians arrived to visit family and friends – the highest monthly total since at least 2010. The Bulletin notes that St Helenians living abroad tend to visit family and friends during the months around the Christmas period, and that there has been additional capacity on the scheduled airline following the introduction of a seasonal mid-week service. The life expectancy of a child born in 2018 is estimated to be around 77 years; this compares with a UK life expectancy of 81. Countries with similar rates of life expectancy to St Helena include Argentina, Mexico, the United Arab Emirates, Poland, the Maldives, and French Polynesia. The full Statistical Bulletin can be found on the St Helena Government website here: http://www.sainthelena.gov.sh/statistical-bulletin-no-3-2019-population/ detailed data can be accessed in Excel format from the ‘Population’ file via: www.sainthelena.gov.sh/statistics-data. Councillors will be holding a series of meetings in each Island district throughout April for constituents to ask questions, raise concerns and find out what has been happening lately within St Helena Government Directorates. A key topic which Councillors wish to discuss at these meetings is how best to communicate with constituents. For example, would you like to continue having district meetings or to have larger gatherings? Would you prefer all 12 Councillors to attend constituency meetings? Options can be discussed with Councillors at the meeting. If there is a particular topic that you would also like discussed, please telephone the Secretary to Elected Members on tel: 22590 or email: sec.em@helanta.co.sh in advance of the meeting you plan to attend. Your Councillors look forward to meeting with you and hearing your views. 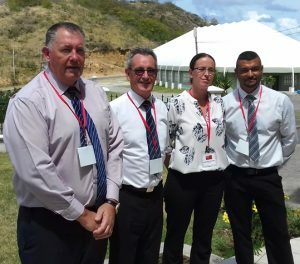 St Helena Government’s Harbour Master, Steve Kirk, Emergency Planning & Sea Rescue Manager, Simon Wade, and Operational & Civil Contingencies Manager, Ian Johnson, along with the Foreign & Commonwealth Office’ CSSF (Conflict, Stability & Security Fund) Projects lead, Sam Cherrett, are currently representing St Helena at the Red Ensign Group Conference in Montserrat. The delegates join 68 representatives from other UK Overseas Territories in a four-day programme of presentations, workshops, and discussions covering several aspects of Maritime Safety and Legislation. Topics include Ports, Coastal State and Registration of Vessels and the crucial role it plays in enabling Coastal States to meet mandatory international obligations by 2020 which St Helena is legally bound i.e. SOLAS (Safety of Life at Sea), MARPOL (Marine Pollution), UNCLOS (United Nations Convention of the Laws of the Seas). The UK and Overseas Territories will be audited to assess compliance of the obligations. Attendance at the Conference was funded under the Maritime Obligations work as part of the Justice, Security and Governance programme of the Foreign & Commonwealth Office’ Conflict, Stability & Security Fund. Further information will be provided when the delegates return to St Helena. St Helena Government was disappointed to read in three recent Sentinel articles – ‘St Helena Coffee under Threat from Tax Reforms’ (p.5, 7 March) ‘Stop the Devaluation of St Helena Coffee’: Coffee Producers Band Together (p. 6-7, 21 March) and Refocusing the St Helena Coffee Discussion: Back to the Real Issue (p. 6-7, 28 March) – that the 2018 Tax Reforms have been cited as a potential threat to our niche St Helena Coffee product. There unfortunately has been a misunderstanding of two separate policies – The Tax Policy which supports the achievement of the goals of the Sustainable Economic Development Plan (SEDP) and the SHG Biosecurity Policy on the protection of a particular local species of plant. 20% to 5% on ‘Trees, shrubs, and bushes, grafted or not, of a kind which bear edible fruit or nuts’ or plants in general. This was not specific to coffee plants. The reduction in Import Duty was one of a range of duty reductions made in April 2018 and is to help the agriculture sector which is one of the SEDP sectors, and in particular assist horticulture and fruit growing. We note that at the time of this press release there was little commentary on these changes by the Sentinel in their following publication on 12 April 2018 except to point out that ‘SHG April 6 released new customs and excise tariffs to come into effect May 1’. The Economic Development Committee (EDC) endorsed the SEDP which encourages coffee growth in general and Income Tax has also been reduced for coffee growing activities, but there has never been a policy endorsed by EDC to encourage the specific bringing in of coffee plant material. The Agriculture & Natural Resources Division (ANRD) has Biosecurity measures which adequately safeguard the St Helena coffee industry from new pests and disease arriving on-Island. We are aware that St Helena Coffee is special, but it is currently unknown whether the uniqueness of the bean stems from some previous cross pollination to create a unique strand of coffee plant on St Helena, whether the growing conditions such as soil and temperature create the unique taste, or it is a mixture of both, which allows St Helena’s coffee to be of such high regard globally. This is an area that SHG will be looking into in response to the letter by coffee growers, and regulations against the importation of new coffee plant material and seeds can be considered on the back of this, should the import of coffee plant material be a risk to the existing stock. It is noted that there have been no queries from any prospective importers regarding the requirements for, or possibility of importing coffee in either plant or seed form made to Biosecurity at least since the year that ASYCUDA reported imports (May 2016), and any potential change is to mitigate future potential problems which could occur. Unfortunately, the Sentinel has made claims that a policy of importing coffee plant material exists in SHG – but it does not. We apologise that there has been a misunderstanding around SHG’s policy with regards to coffee growing and we hope that this information clarifies the situation. The EDC has invited both coffee growers and the Sentinel to discuss the issues around coffee growing on Thursday, 4 April. SHG representatives will be there to listen to concerns and assist where actions are necessary to protect and enhance St Helena’s coffee industry. The Environment & Natural Resources Directorate (ENRD) has restructured from 1 April 2019. ENRD has now split into two separate directorates – Environment, Natural Resources & Planning and Infrastructure & Transport. A full contact list for all services will be issued shortly.